After earning a Bachelor of Science degree in Natural Sciences from Xavier University in 1996, he went on to receive his medical degree from the University of South Carolina School of Medicine in 2000. 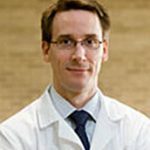 He then completed his internship in Internal Medicine at Evanston Hospital in Evanston, Illinois in 2001, and his residency in Neurology in 2004 at the University of Michigan. He was appointed chief resident in his final year of residency training. Kerber then completed fellowship training in neuro-otology in 2005 at UCLA under the directorship of Robert W. Baloh, M.D. In 2008, he completed a Master of Science degree in Health and Healthcare Research from the UM Rackham Graduate School. Kerber’s research and clinical interests center on the presentation of dizziness, which include a number of disorders that typically involve the cerebellum, brain stem, or peripheral vestibular structures. His current research focus is using health services research approaches to optimize patient care and health care utilization for dizziness presentations.